Rehearsing his music, Lucian Tripon '21 sings outside with Chamber Choir. Now one group larger, head director Mr. Andre Clark and assistant director Ms. Jennifer Alexander were excited to show the growth and talent of the choir program at the Fall Concert on Tuesday, Sept. 25 at Hope Presbyterian Church. While the previous year did not have a stand-alone men’s choir, this year Mr. Clark proudly showed off the Concert Men’s group with 31 members, mostly consisting of freshmen. The growth in numbers comes directly from the choir program at Canyon Vista Middle School, where it has flourished more than ever before. 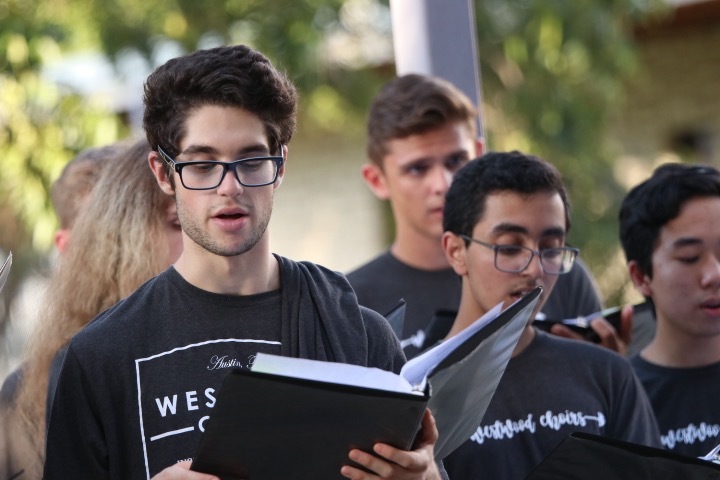 “It’s really exciting having guys in choir and it’s not something you usually see because choir is not necessarily cool in high school, but it’s awesome to see all of these guys following what they want to do and having fun with their passion,” Co-President Pooja Enagala ‘19 said. The concert had a heightened energy due to a mix of traditional choral music and folk songs like Dancing-Song, sung by Varsity Women; Niska Banja, sung by Concert Women; Tantsulaul, sung by Concert Men; and Shenandoah, sung by Chamber Choir. Many of these songs were sung acapella and allowed the choirs’ vocal talent to be on full display. Since his first day as Head Choir Director, Mr. Clark has had a focus on tradition and the way it can bring the choir program closer to create a unified group. The group song Ay Ay Ay is an old tradition that for the past few years has not been incorporated into concerts, but for the Fall Concert, everyone in the program went on stage to sing it before The Lord Bless You And Keep You, which is performed at all choir concerts. The growth of the choir program is reflected in the new team of over 20 choir officers, the addition of section leaders to the officer team, and the constant support from every choir during class, rehearsals, and concerts. The choir’s next concert will be the Vertical Concert on Thursday, Nov. 1 at 6:30 p.m. at the Round Rock ISD Performing Arts Center.